Vacuum Chamber Design Services | Design & Project Management - Meyer Tool & Mfg. ​At Meyer Tool & Mfg., our vacuum chamber design services are ideal for myriad professions. Engineers, scientists and professional procurement specialists are all among our clients — along with a range of diverse industries. Our best clients come to us again and again, looking for assistance in reviewing designs and improving fabrication inefficiencies. We strive to make the design perfect in every way. 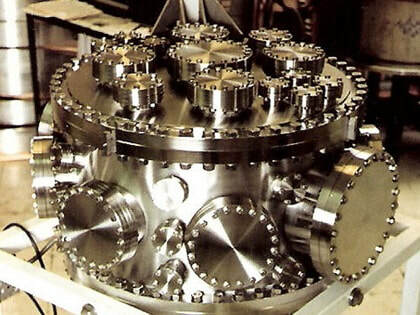 Let us design your next custom vacuum chamber! You don't have to be a scientist or an engineer to use our vacuum chamber fabrication service, and you don't have to work in a university or a lab. You just have to be in an industry or job that requires custom vacuum chamber design, for whatever purpose. Give us your specifications and requirements. We can work with you. ​Our vacuum chamber fabricator services are client-focused. You will receive a dedicated engineering resource for your project. This resource will be your point of contact for the entire project. Any time you have questions about the design and/or what we are doing, if you need to make changes, or for any other reason, your point of contact will help. He or she will relay your requests with the rest of our team. This streamlines the design and manufacturing process — making it easier for you to get your project done correctly, to your instructions and on your schedule. Once we take on your project for a vacuum chamber or ultra-high vacuum chamber, our engineers will use your completed design or drawing, or develop their own from your instructions. They will use this to create a set of fabrication prints and step-by-step instructions on how to build the chamber. If you prefer more personalized service, our engineers will work directly with you to create a custom design from the beginning of the project. No project is too big or too small. Your chamber may only be the size of a can of soda, or it might be as big as a city bus. It doesn't matter. If you can envision it, we can design it. We will even help you determine the best type of chamber for your project, if you are not sure at the beginning. This is a complete custom design service, and we can be as involved and creative as you like, or we can simply bring your design to life. The choice is yours. ​Start consulting with us now, and know your project will be ready on time and fully functional. Remember, we are custom vacuum chamber design professionals, and have worked with everyone from individual and small groups of academics to NASA-level projects. Please contact us today to begin discussing your unique project. We are eager to hear from you, and to show you how we can benefit your project.